Tehran Mori Hostel v Tehran, Írán: Zarezervujte nyní! we accept any age/type travelers . Tehran Hostel is the first hostel in Iran! We opened our hostel at the beginning of 2015 with the excellent value for travelers. While Tehran offers an interesting cultural experience, it is important to relax and unwind after a busy day of sight seeing. Our hostel is in a wonderful quiet district,and has 'chill-out zones', such as couches, balcony and very nice yard. We understand that it is important to reconnect sometimes, and have a small laptop and printer, which you can also use! You can use your own device or computer in the lounge. 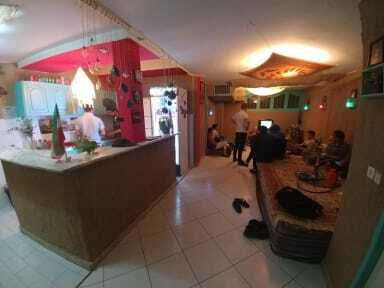 Tehran Hostel is located in the heart of Tehran, but unbelievably calm and nice. It's just 3 minutes walking to the red line metro station (Taleghani) which is very important for travelers. You don't need to change lines and spent time to go for sightseeing! There are artist house and American embassy close to us which travelers like to visit that as well. We are also exactly next to bahar house who was a important person with many crazy issues which we can talk about here. We have different dormitories with comfortable new mattresses. You can also stay in one of our private rooms if you wish. Heating and air-conditioning is featured in all of the rooms and communal areas. The hostel consists of five floor building, a big yard, nice balcony, many common area's, good kitchen and shared bathrooms with 24/7 Hot water for showers. We do accept midnight arrival . Pickup service possible via our email.